Metallica's new album will arrive "sooner" than fans expect. 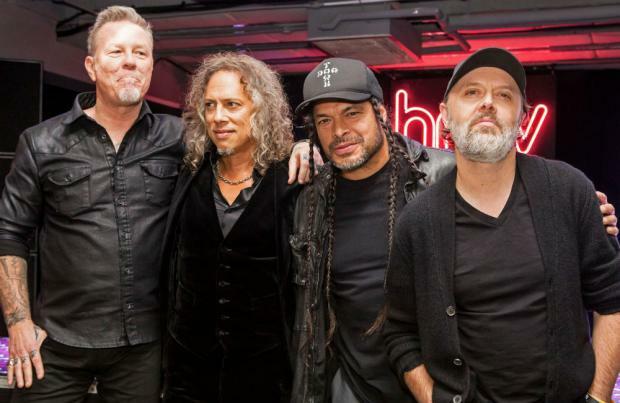 The Grammy-winning heavy metal band's bassist Robert Trujillo – who is joined in the 'Nothing Else Matters' band by James Hetfield, Lars Ulrich and Kirk Hammett – has teased fans that their follow-up to 2016's 'Hardwired... to Self-Destruct' will have a shorter release gap than 'Death Magnetic', which came out 11 years ago, and their last outing. Speaking to Neil Griffiths for 'The Music' podcast, he said: "It [the album] will come a lot sooner than the previous two did ... this time around I think we'll be able to jump on it a lot quicker and jump in the studio and start working. "We've all vowed to get this one going sooner than later. "Now, how soon? I don't know. "It's been over two years now. "At some point, sure, we'll need to take a little bit of a break. "It's sort of the right thing for us to do because we've been going so hard." The 54-year-old rocker says despite the band's hectic touring schedule, they always find time to head to their space called 'The Tuning Room' to bash out and record the ideas they get from their jamming sessions backstage. He said: "We have a zone we call 'The Tuning Room' which is a space where we can jam and warm up before the show. "We're always in there coming up with ideas and you may get a few seconds of an idea but everything is recorded, always. And then of course at home, everyone has got ideas." He also admitted that he is excited for their next record – which will be their 11th – as it will return to being a "collaborative" effort, unlike 'Hardwired...', which was frontman James Hetfield's baby. He explained: "'Death Magnetic' was, for the most part, a collaborative effort. "'Hardwired' was more central to James's [Hetfield, guitar/vocals] specific ideas and was also taking the spirit of what we had done on the previous record. "I'm excited about the next record because I believe it will also be a culmination of the two records and another journey. "There's no shortage of original ideas, that's the beauty of being in this band."